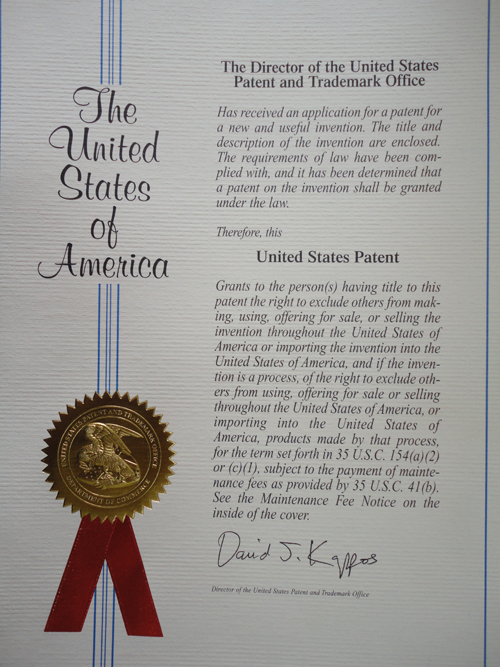 KIB Received a Patent Authorized by U.S. Through many years of accumulated research work, the research results of the research group led by the researcher of KIB, LIU JiKai and Kunming Institute of Zoology of CAS obtained U.S. patent. This is the first patent we have received which was authorized by U.S. Patent named, "Daldinia concentrica and its derivatives, their preparation, including pharmaceutical compositions and usage". The patent No. is US7659308B2, authorized on 9th February 2010, the patent is valid from 20th October 2004 to 7 th August 2025. The first inventor of the patent was the researcher of KIB, LIU Ji-Kai and the other inventors include ZHENG Yongtang, QIN Xiangdong, YANG Liumeng, DONG Zejun, WANG Ruirui and TAN Jianwen. The range of patent protection is: Daldinia concentrica compounds with novel structures, Daldinia concentrica compounds with therapeutically effective amount and pharmaceutical compositions of carriers that are pharmaceutically acceptable, preparation method of Daldinia concentrica and applications of Daldinia concentrica and its pharmaceutical compositions in preparation of drugs for treatment and prevention of AIDS. The patent was first submitted for patent application on October 22th, 2003 in China, the Chinese patent application No. is 200310110784.5, and within the oneyear priority period from the patent application date in China, on October 22th, 2003 it was submitted for application of the PCT International patent, international patent application No. is PCT/CN 2004/001188, the PCT application was open on April 28th, 2005, the publication No. was WO2005/037841. Since then, it entered the stage of national application for protective state, on March 5th, 2007 the application for the patent for invention was submitted, the application number was 10/576, 758, and became public on July 5th, 2007, the publication No. was US-2007 -0155830-A1.